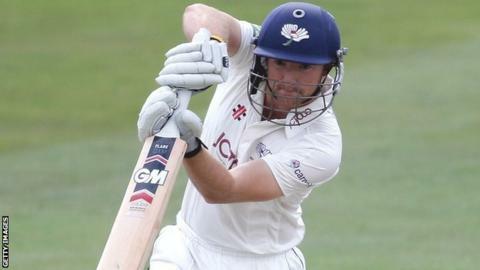 Adam Lyth scored a half-century as promotion hopefuls Yorkshire battled to take control on a hard-fought opening day against Essex at Chelmsford. The Tykes claimed two batting points as they finished on 284-8 after Lyth scored 67, Azeem Rafiq an unbeaten 49 and Phil Jaques 38. Graham Napier was the leading Essex bowler with three wickets. Yorkshire, relegated in 2011, will make an instant return to the top flight if they win this Division Two match. They won the toss but made a poor start as Joe Root was trapped lbw by Napier without scoring. But Lyth and Jaques added 82 for the second wicket before both fell to Napier. After Yorkshire slipped from 113-2 to 166-6, Andrew Hodd and Rafiq put on a vital 58 for the seventh wicket. Rafiq and Ryan Sidebottom, who made 37, shared an eighth-wicket stand of 60 before Sidebottom was caught and bowled by Tom Craddock off what proved to be the final ball of the day.